These Gluten Free Pigs in a Blanket are as perfect for a large holiday gathering as they are for game day eats. They are made using an easy gluten-free and nut-free dough that doesn’t need any chilling time. 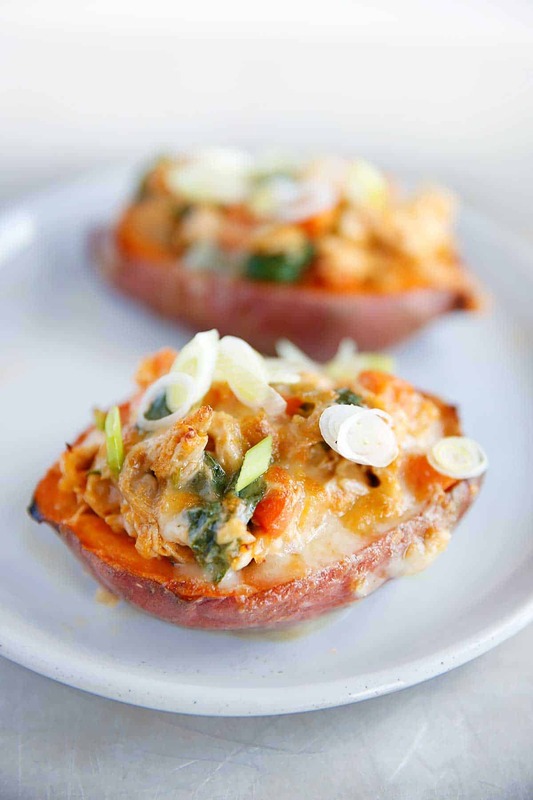 These are a sure crowd pleaser for both kids and grown-ups alike! Just because we don’t eat wheat doesn’t mean we shouldn’t be able to eat pigs in a blanket, right? 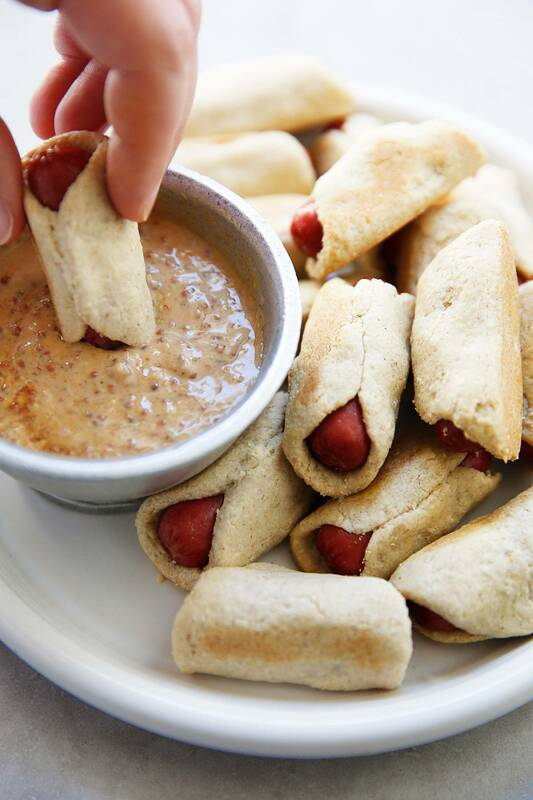 This Gluten Free Pigs in a Blanket recipe saves the day because this adorable appetizer is both tasty and easy to put together for the next time you need to feed a crowd! I’ll let you in on a little secret, this recipe was in development for a while! Sometimes you get a recipe right in the first trial or two, and sometimes you question whether you are ever going to get it to right where you want it to be! And there was a moment when we didn’t think we would ever hit publish on our Gluten Free Pigs in a Blanket. But we had a breakthrough and we’re so happy with the final result. The first few times we tested this we were using our typical almond flour and tapioca flour blend that is usually our first stop in baked goods. Unfortunately these resulted in dough that had good flavor but was a bit too crumbly for our liking, and was somewhat hard to roll out. While we were testing these we were also testing our new gluten-free and nut-free crust on Pumpkin Pie. 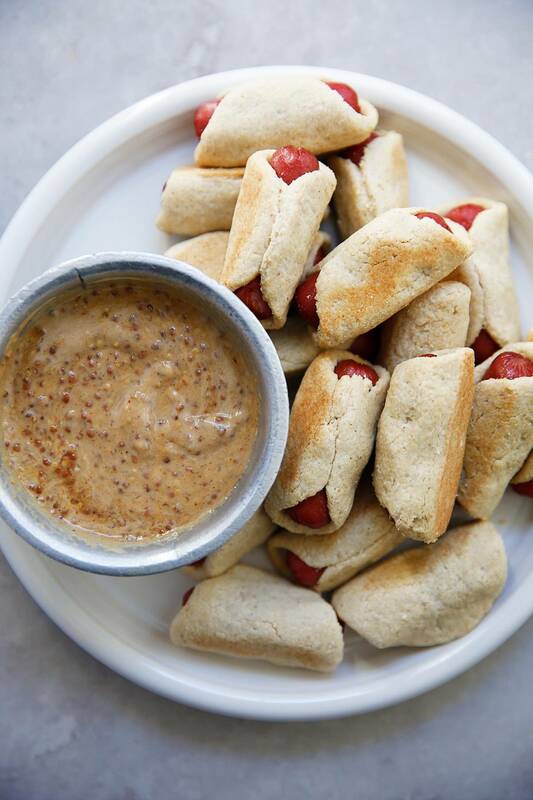 We really loved the ease of working with that dough and thought it had a nice neutral flavor so we gave it a go on our Pigs in a Blanket and it was then we knew we were on to something. We changed up a few things including introducing more savory elements and at last we had a winner! We added apple sauce to this dough and loved the results. You don’t know there is apple sauce in it, but it contributes to an improved flavor and texture. The dough comes together in a food processor in a few minutes. Just make sure that you don’t overprocess the dough: Once it has come together stop running the processor. After it’s made you CAN roll out the dough right away, which we love. This is unusual for pie crusts, that usually need to wait to rest and firm up. 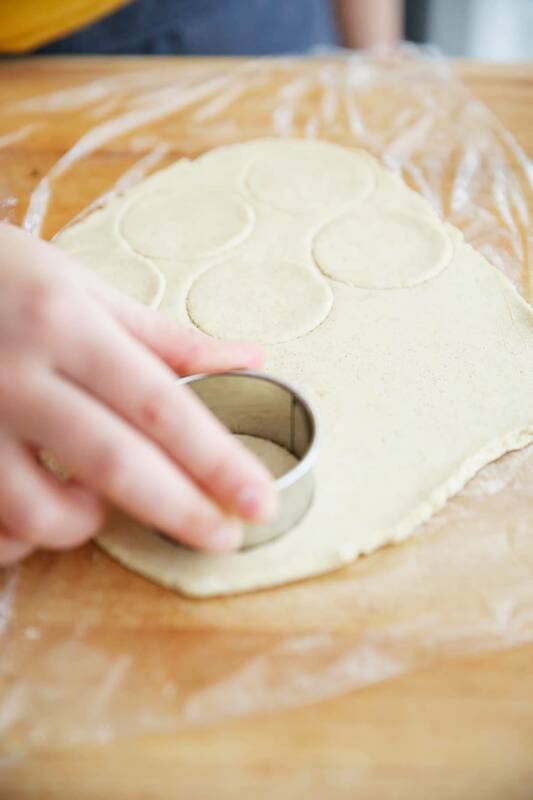 We found it easiest to roll the dough between two sheets of plastic. Normally we shy away from plastics, but in this crust it really is easiest if you use that vs. parchment paper. But if you don’t keep plastic in your home (we get it! ), parchment will do in a bind! We really loved working with this dough and found it simple. It should look similar to the photo above. We worked with this dough over a dozen times and have always found it super simple to work with, but we’ve gotten some feedback that some people making the dough found it wet. After testing it some more, while we never have been able to accidentally make a wet dough when following the recipe, we’ve discovered that oat flour is a bit difficult to measure out properly in the cup measurement because sometimes it is more densely packed in the bag than others. For fool proof measuring you can weigh out the oat flour instead. If you find your dough a bit more wet than the above photo add in oat flour a tablespoon at a time until it feels workable. To roll it out we suggest using plastic wrap. Parchment paper can work too, but it isn’t as easy. Wax paper might work as well, but we did not test that. 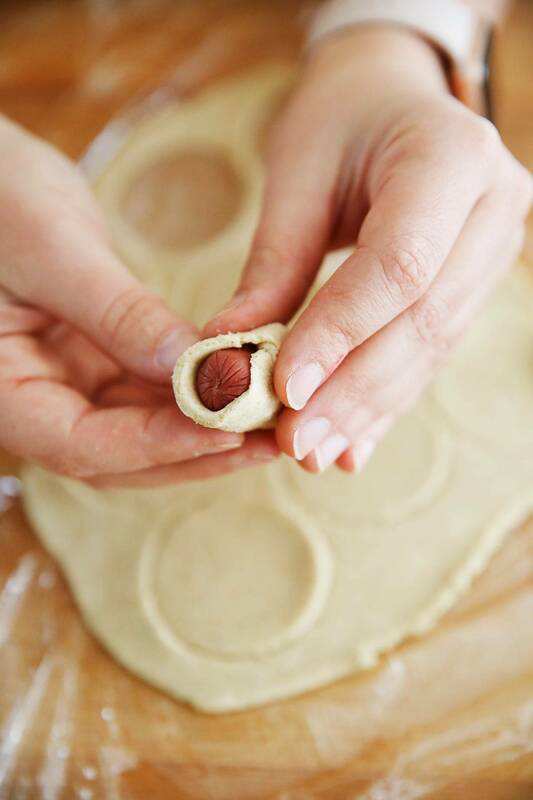 Once it’s rolled out we use a simple round cookie cutter, with the width the same size as the hot dogs we were using to stamp out a piece of dough and then wrap it around. We preferred this method than cutting out triangles and rolling them, because this method gave us equal portions of hot dog and dough! Pre-heat oven to 350ºF and line a baking sheet with parchment paper or a silpat. In a food processor combine oat flour, tapioca flour, garlic powder, mustard powder, salt, and cold butter and pulse until the butter is broken down into pea-sized pieces. In a small bowl whisk egg and apple sauce together. With the food processor running, add egg mixture and process until the dough just comes together. 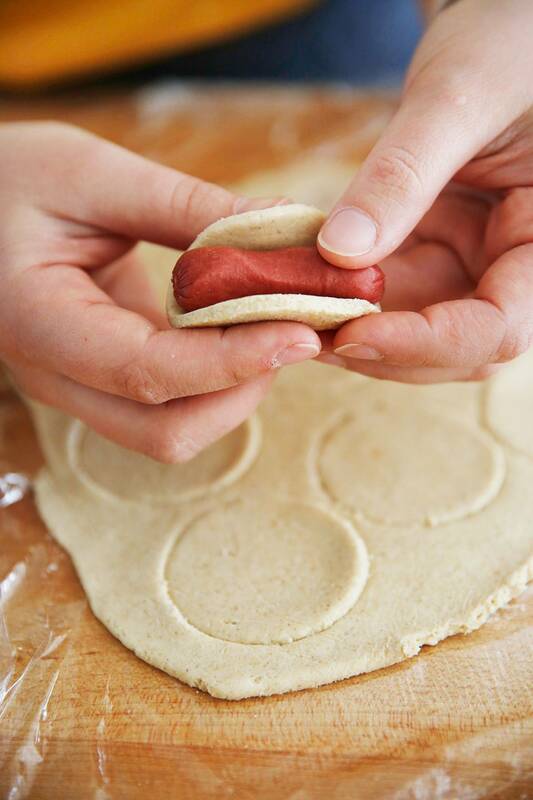 Wrap the stamped out circle around the dried off hot dog and pinch together until it has sealed. Place on baking sheet. Continue working until all of the hot dogs are wrapped. Bake for 12 minutes. Take out of the oven and turn the Pigs in a Blanket over and continue to bake for another 5 minutes. Remove and serve warm or room temperature along side some grainy mustard. Apple sauce contributes a very minor sweetness to the dough that is needed because of the oat flour, and it also contributes to the texture. You won't notice there is apple sauce in here necessarily, but the apple sauce is needed for improved taste and texture. See post for trouble shooting if you run in to issues with the dough. We tested this with homemade oat flour made in a high-speed blender and do not recommend using this. We had much better results using store-bought (gluten-free) oat flour. If you find that your pastry is on the wetter side, add in a bit more oat flour until it feels workable. Oat flour can be a bit tricky to measure out because sometimes it is densely packed in the container, and sometimes not. For a foolproof way to measure weigh it out instead of using a cup measurement. I love Labor Day Weekend! It’s the last long weekend of the Summer, and it usually means beaches, BBQ’s, and all those summer recipes you’ve been pinning and saving. 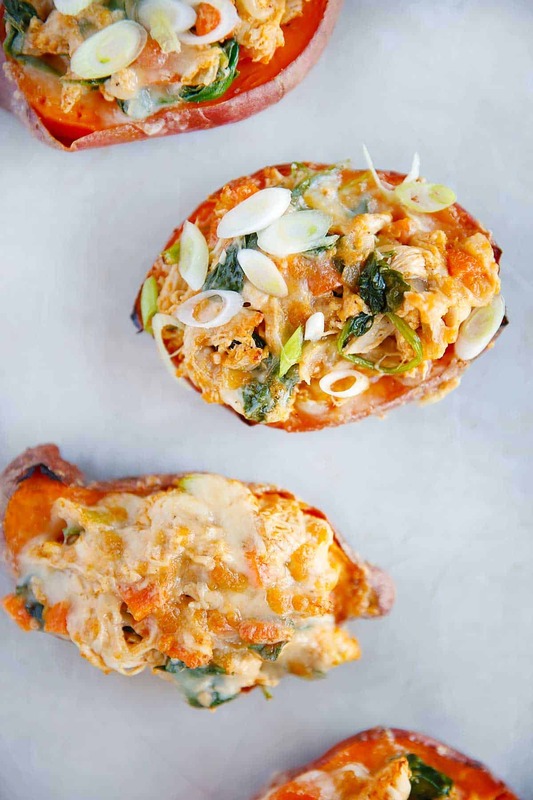 I’ve rounded up some favorite appetizers, side dishes, main dishes, and treats to satisfy every person at your home this weekend with these healthy labor day recipes! While cook outs and BBQ’s are a great way to end the summer, you can also bring healthy and delicious dishes that everyone will LOVE. 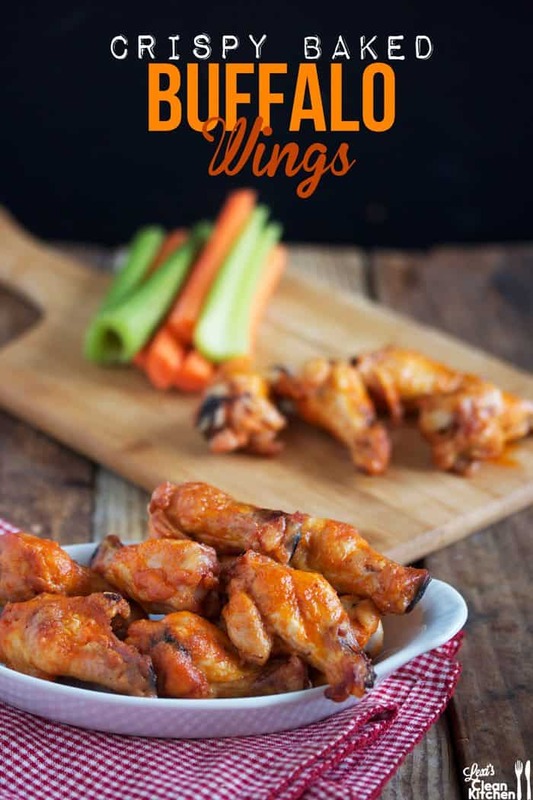 You can’t have a Superbowl party without wings (in my opinion)! You can though, have them crispy and flavorful without being fried. I visited friends at the University of Buffalo years back. We, of course, got the famous Buffalo wings and as you can imagine they were fabulous. In college I was a big fan of Wings over Amherst (these are not healthy). I definitely still think about those fried boneless wings (and the cajun cheese fries). Many of my friends ordered honey mustard, BBQ, garlic parmesan… me? Give me Buffalo any day of the week. 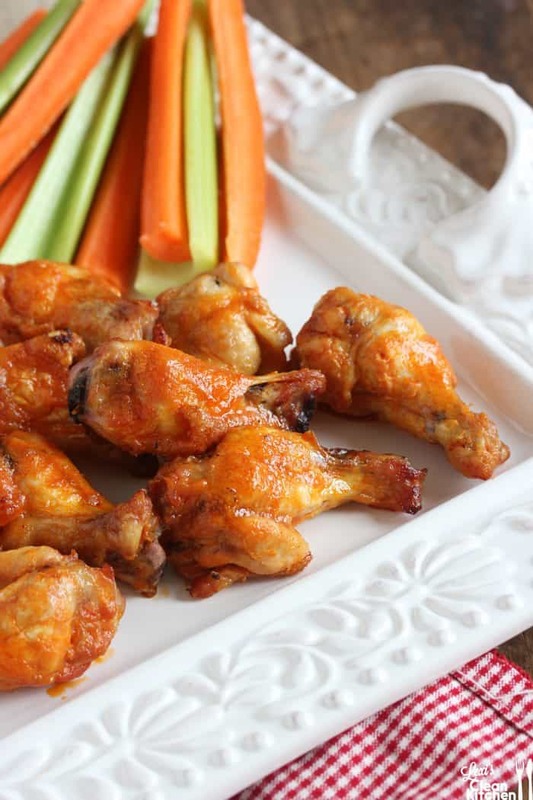 Can you bake chicken wings? The tip I found years back that I love (and successfully tried with my Sweet Potato Chili Fries), is placing a wire rack on the baking sheet. Gets everything nice and crisp! Can you use chicken legs or chicken thighs? Yes! Just adjust cooking time and sauce amount as needed. 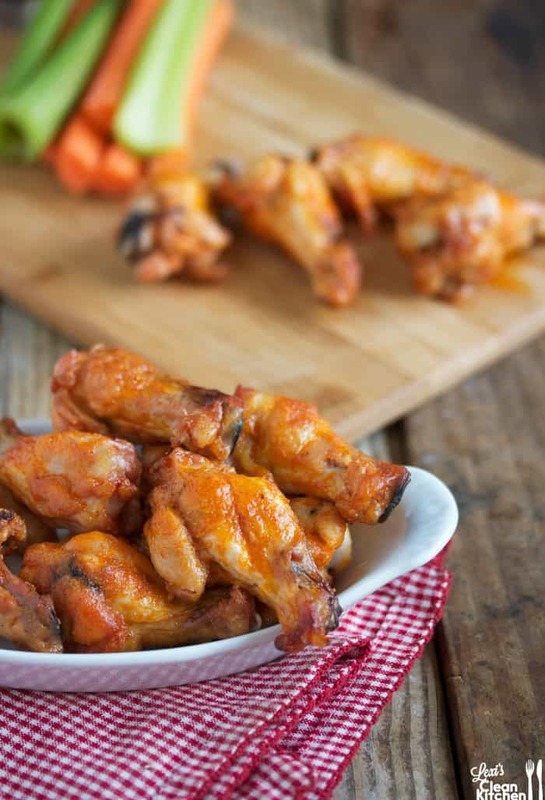 Pat chicken wings dry with a paper towel, and then coat the chicken wings in oil, salt, and garlic powder. In a saucepan, bring hot sauce and butter to a boil then remove from heat and stir. Remove wings from oven and toss them in the sauce. Serve hot with dippings of choice, like carrots, celery, and the ranch dressing in my cookbook. For fully dairy-free sub butter for your favorite vegan butter or oil of choice. Have time to a marinate? Though not needed for this recipe? Marinate overnight in the sauce, and make additional sauce for tossing! 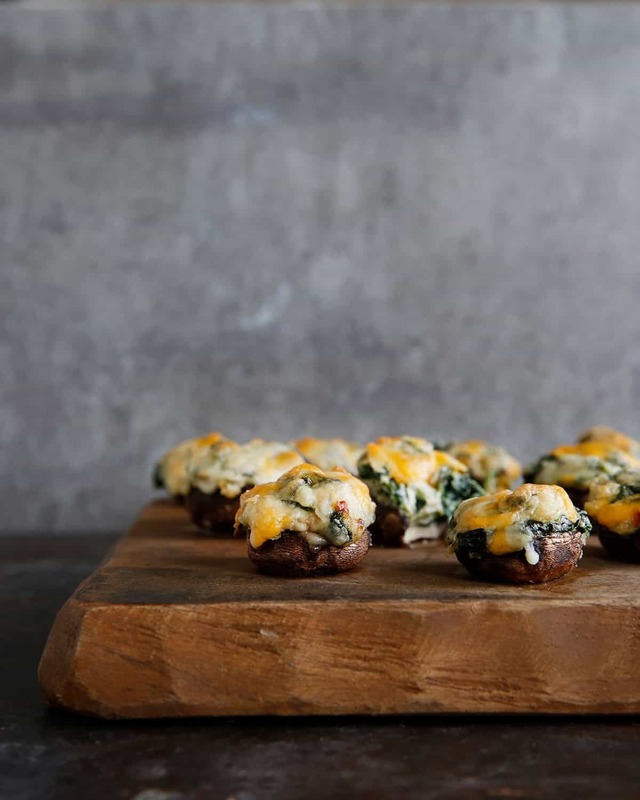 These healthy Spinach Dip Stuffed Mushrooms are a lightened up take on the classic hearty spinach dip we know and love, made into the perfect holiday baked stuffed mushroom appetizer. 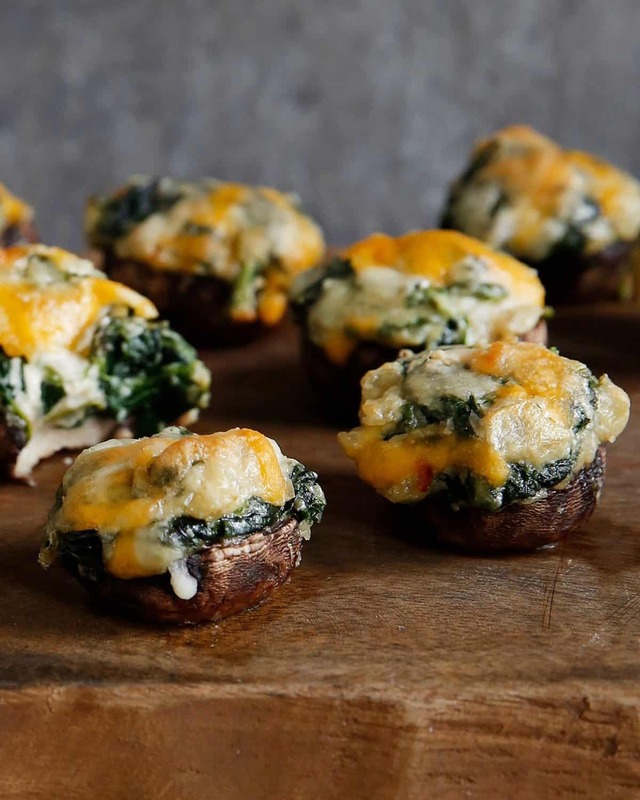 This stuffed mushroom recipe is easy to prepare, and simply omit the cheese on top for a vegetarian, whole30-approved, and dairy-free stuffed mushroom! To celebrate the one-year anniversary, I thought I’d share on of the popular appetizers that is PERFECT for holiday entertaining. I demo’ed these at many book signings last year, and they were a hit every time! 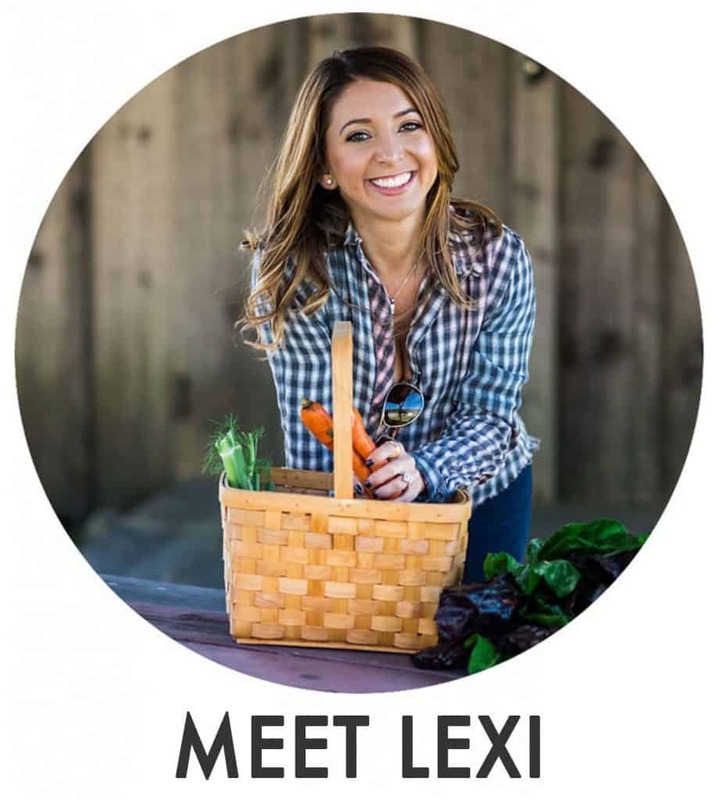 Chapters including Rise & Shine Breakfasts, Main Dishes, Soups & Salads, On the Side, Little Bites, Lexi’s Basics, Sweet Treats, and Beverages. 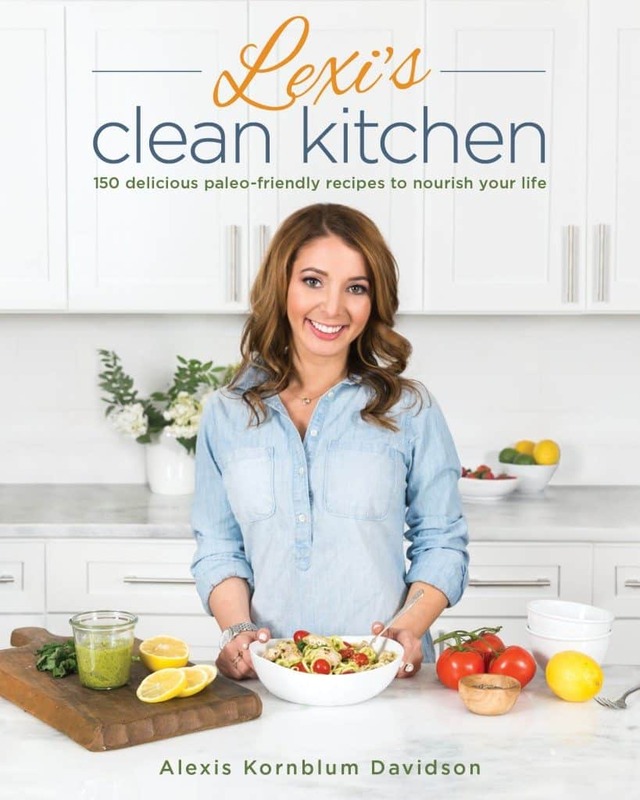 A variety tips, tricks, and tools such as A Guide To Clean Eating, A Conversion Chart, Cheat Sheet Guides, & much more. Spinach dip was my favorite way back when, and this recipe nails that exact spinach dip flavor I love, but is made with healthier ingredients and is transformed into delightfully handy pass–around appetizers! Soak the cashews in a bowl of water for at minimum 1 hour or up to 8 hours. Preheat the oven to 375ºF. Line a rimmed baking sheet with parchment paper. Heat the butter in a large skillet over medium heat. Add the garlic, shallot, and onion and cook until soft, about 3 minutes. Fold in the spinach and cook, stirring occasionally, until the spinach has wilted. Set aside. 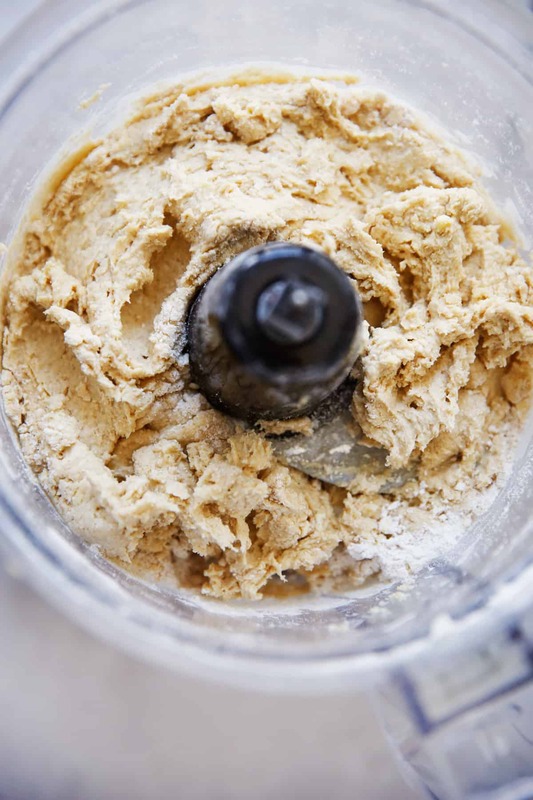 To make the cashew cream: Drain the soaked cashews and place them in a small food processor or high-speed blender. Puree the cashews with the 1 tablespoon of olive oil and ½ teaspoon of salt. Fold the cashew cream into the spinach mixture until evenly combined. Arrange the mushroom caps on the lined baking sheet and brush the outside of the caps lightly with olive oil. Scoop a large spoonful of the spinach mixture into the cavity of each cap. Top with the cheese, if using. Bake in the oven for 15 to 20 minutes or until the mushrooms are soft and the cheese has begun to brown. Serve warm or at room temperature. Variation: Hot Spinach Dip. Egg-free and dairy-free (if cheese is omitted), this is your solution to a hot, creamy party dip that everyone can enjoy. 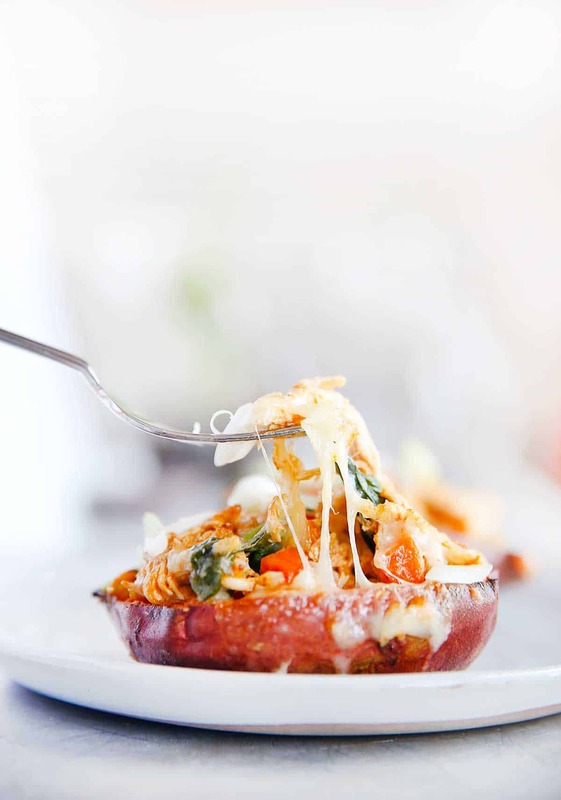 Place dip into an oven-safe bowl, top with cheddar cheese, if desired, and bake until the cheese is golden. Use homemade crackers (page 000), veggies, or plantain chips for dipping. 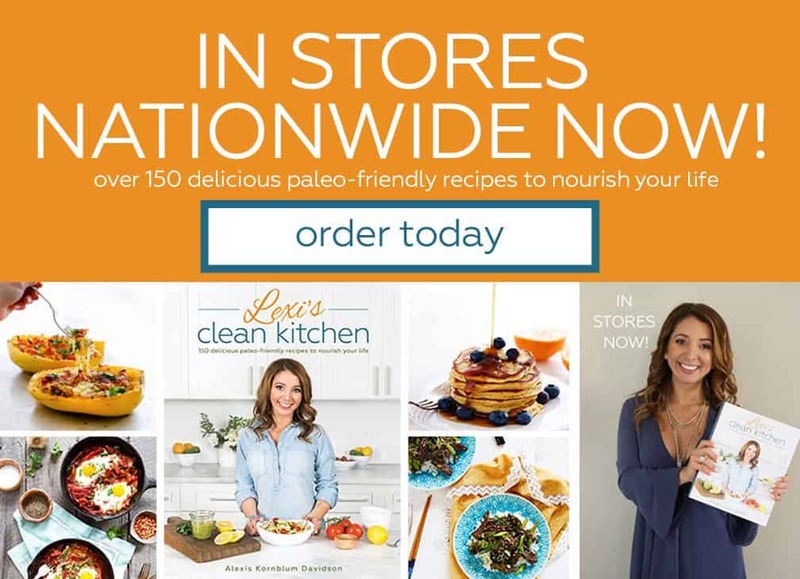 Want to check out more about the cookbook? Learn more here! See what my blogger friends have made from the cookbook here! I am so excited that December is here and the holiday season is upon us! Today for Healthy Food Friday with American Express let’s talk about an entertaining staple: How To Build The Ultimate Cheese Plate. We have been entertaining so much lately and my favorite appetizer to throw together is a cheese plate. You can get so creative. And with this simple guide, you can put together some amazing flavor combinations that everyone will love! Grab one or two platters. You may be surprised to find that you may already have things to use at home! I always like an assortment that can work for anyone and everyone! Cured meats are always great to accompany your cheeses. *Try slicing your salami, tossing it in your favorite homemade teriyaki sauce, and broiling for 3-5 minutes! Candied or regular nuts are a great accompaniment (or just to snack on)! Some fresh or dried fruit is always wonderful, along with jams (a must!). 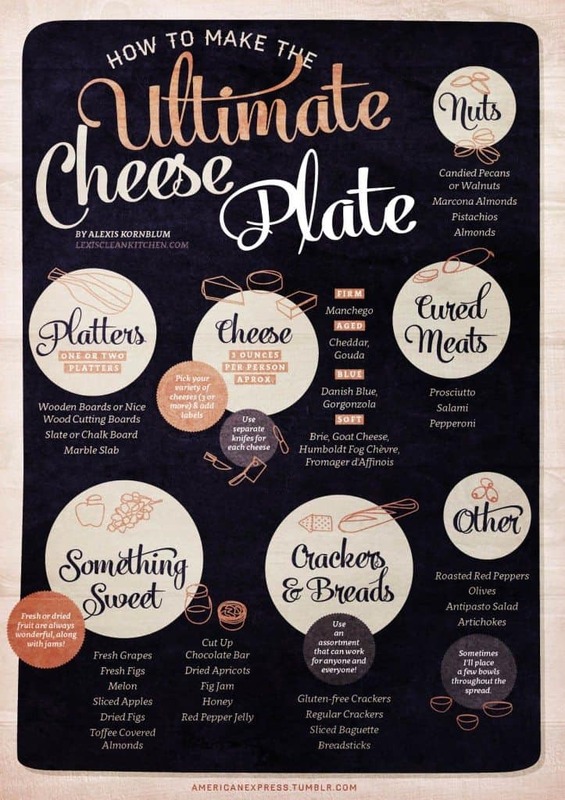 What do you add to your cheese plate?